There are a number of benefits of flaxseed for anyone but especially for those practicing the vegetarian lifestyle. Flaxseeds look somewhat like sesame seeds, but are slightly larger. There are two basic types, golden and brown, but there is not much difference between the two. There are usually added to breads and baked goods either whole or ground. When they are ground, flaxseed can be sprinkled over cereal, yogurt, and ice cream, or mixed into a smoothie. Flaxseed has been used for over five thousand years. Cultures in Europe, Asia, and Africa have depended on flax for both its fiber and the nutritional content of the seeds. 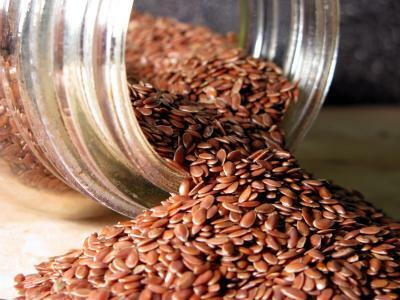 Adding flaxseed to your diet will increase your intake of omega-3 oils. Omega-3 is found in generous amounts in fish like salmon, but is not so easily available in the vegetarian diet. This oil is thought to protect the body in many ways. Heart Disease - Omega-3 helps the blood to produce substances that reduce the formation of blood clots. This reduces the likelihood of heart attack and strokes in heart patients. This is one of the reasons you should always let your health care provider know if you are planning to use flax seed in your diet. High Blood Pressure - Omega-3 oils help prevent high blood pressure as well as controlling it in those who have all ready developed hypertension. Diabetes-Adding flaxseed to your diet can increase the flexibility of cell membranes in your body. This is important because cell membranes are more able to respond to glucose and insulin that stiff cell membranes. Colon Cancer - One of the important benefits of flaxseed is the prevention of colon cancer. The Omega-3 oils protect the colon cells from the free radicals that can lead to the development of cancer cells. Cholesterol - Flaxseed has the ability to significantly lower cholesterol in those with high cholesterol levels. In fact, some researchers believe that eating 20 grams of ground flaxseed per day is as effective as prescription statin drugs. Fiber - Flax is rich in fiber and helps to keep the digestive system healthy and functioning normally. Prostate Tumors - Men facing surgery for tumors of the prostate were given 30 grams of flaxseed a day as a dietary supplement. The existing tumors stopped growing and researchers believe the oils in flaxseed alter how cancer cells stick to other cells. The anti-angiogenic lignans may choke off the tumor's blood supply as well. Breast Cancer - Post menopausal women who eat about an ounce of flaxseed per day have been found to have a decreased risk of breast cancer. The flax is believed to have an effect on how the estrogen is handled in the body without affecting the way that it protects the bones. Therefore flax may lessen the possibility of breast cancer while allowing estrogen to protect against osteoporosis. Inflammation - Flaxseed has been shown to reduce inflammation in arthritis as well as some diseases like Parkinson's disease and asthma. In addition, flaxseed it a low carbohydrate whole grain and it can be used extensively in a low carbohydrate diet. It helps to maintain your weight loss as well. Adding flaxseed to your diet is a great way to protect your health. It's slightly nutty flavor adds flavor to all kinds of foods, and you can even use it as an egg substitute in baking. To use substitute flaxseed for one egg add one tablespoon flaxseed to one-fourth cup water in a blender. Blend until it is very creamy. Use in your recipe just like an egg. The health benefits of flaxseed are well documented. The more researchers study this tiny nutritional powerhouse the more benefits they discover. It is inexpensive, widely available, and easy to use. Try adding flaxseed to your diet and begin experiencing the health benefits.